I am one of those people who hasn’t seen the critically acclaimed television series Lost. When I told my wife this, she said, “Wait… you have never watched Lost? We are watching it tonight.” While it didn’t get turned on that night (Game of Thrones takes precedence on Sundays), we started watching the series on Netflix shortly thereafter. We did an episode or two a day, and I made it about halfway through the 1st season. Call it being super busy at the time, but priorities changed and I haven’t watched it since. Maybe it’s because knowing the ending fell on such a divide among fans that I find myself wanting to watch other shows. I am also not great at binge-watching TV, but I am great at binge-playing video games. But enough about me. Why is this even relevant to Dead in Bermuda? I’ll tell you why. 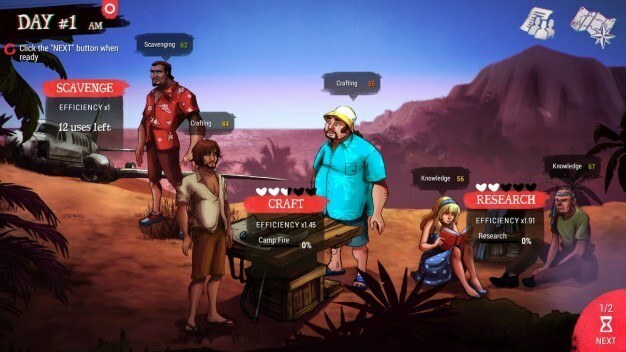 Dead in Bermuda is a survival management sim/RPG developed by CCCP set in a location much like Lost. A collection of people have survived a horrible plane crash and they have to work together to survive life on a strange island. 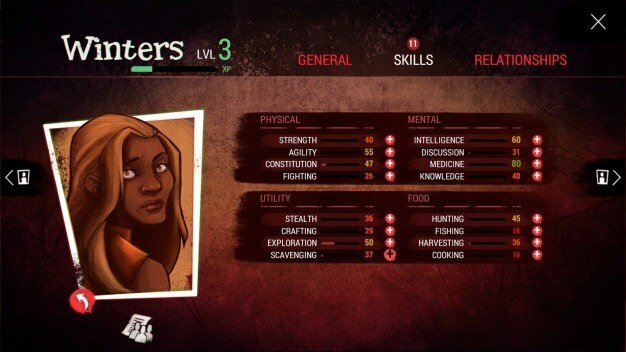 The 8 survivors all have different personalities, strengths, and weaknesses… you’ll find this out quickly when you pull up the character information screen. 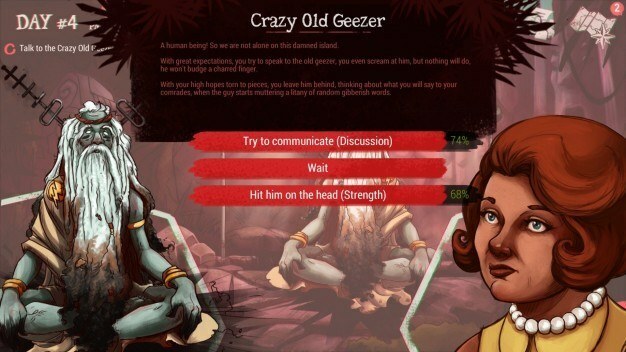 Each character has traits and abilities that you can level up through experience gained. The game provides a tutorial to get you started, but the learning curve feels pretty steep after that. Balancing everything going on in the game can get overwhelming. But if you understand your immediate needs and what can be put off another round, then you will find yourself just barely ahead of that curve. The management portion comes with making decisions on daily tasks. You need food, water, and supplies to survive, which means you have to make important decisions about how you spend your time. You are given the opportunity to perform 2 tasks per day. At the end of the day, everyone gathers around the fire (which you have hopefully kept going) to talk and basically erode each other’s relationships. It felt rare when people starting agreeing or liking each other, and it feels that these relationships can affect their abilities to perform tasks together. You also have opportunities to venture out in the island and discover new areas, learning more about your surroundings and hopefully finding resources along the way. You will stumble on some interesting encounters and there are enemies out there that want to hurt you. Players who have employed scavenging and stealth perks will want to send out their toughest characters in case things go awry, making party planning crucial. In the end, I didn’t survive. The next fishing expedition or location discovery held my group for only so long. After attempting to restart and correct some of these errors, I began to see where I messed up. It will take some real planning to figure out what to do next, and you will really have to test the limits with your characters. 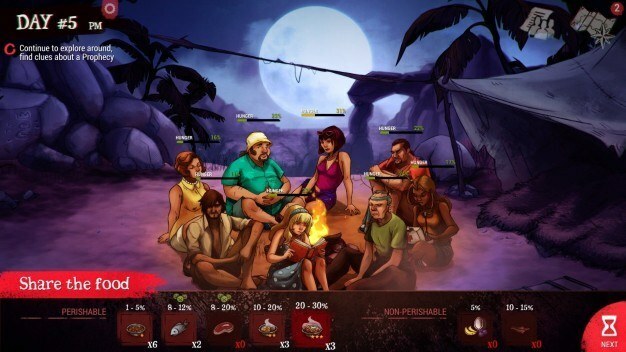 If you are a fan of strategy games with some RPG elements then you will enjoy Dead in Bermuda. There is a story here with characters that have much deeper lives than what you see at the surface (just like Lost). It does at times feel like you are playing a Lost simulator. I highly recommend for those who are interested in these types of games, however, those who are on the fence may want to steer away.